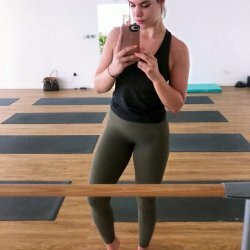 In this post I will share my experiences, favorite restaurants for vegan take away in Dubai and what I learned from trying to be vegan in Dubai for a week! Sunday was a busy work day for me and I was out having fun all day Saturday, so I ordered some vegan take out the day before, to take with me to work. – On Saturday I ate a lot of food for my cheat meal, so I skipped breakfast (usually I kinda intermittent fast anyway) and didn’t eat until lunch-time when I had a bowl of Pumpkin and Tomatillos with Roasted Almonds from Circle Café’s Vegan Menu. – As a snack I had a protein cookie from Lenny & Larry’s. They’re not super heathy, but they’re vegan, taste great and are easy to eat in the car. – For dinner I had Baked Falafel with couscous and Roased Veggies from Under 500. – Despite eating 2 huge fillings meals and a 400 calorie cookie, I was hungry again when I came home at 9:30 PM, so I made a vegan version of my beloved berry/banana protein ice cream. It didn’t turn out quite how I wanted, so I’m not going to share a recipe with you yet, but I will soon. 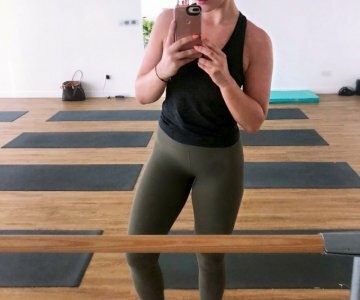 I had a client at 7 am and after I went straight to a hatha yoga session. Then I went grocery shopping. It’s not super easy finding vegan products in Dubai as not all the stores carry them. You have to know what store to go to, to get what you’re searching for. You can get non-dairy milk at every store here, but in my experience, Lulu Hypermarket is by far the best place to shop for vegan groceries. Here I found multiple brands of dairy free yoghurt, plant based milk and cheese. However, in the supermarket closest to where I live, a big Carrefour, I found only one brand of dairy free yoghurt. I was craving yoghurt, so I decided to try it despite the 27 AED price tag (approx 50 DKK). It was a 400 g. container of cherry flavored soy yoghurt and tasted great, but it’s probably not something I’m going to invest in regularly. – For breakfast I had the above mentioned cherry soy yoghurt and 2 slices of crisp bread with smashed avocado. – For lunch I had a mix of broccoli, zuccini, carrots and chick peas topped with ketchup. – As a snack in the car I had a Lenny & Larry protein cookie. – Monday evening I food prepped and made a garlic/tomato pasta and beans dish, that was supposed to last me for lunch and dinner for 3 days… Instead I ate more than half of it for dinner monday night and divided the rest into two lunches for Tuesday and Wednesday. – For breakfast I made vegan protein porridge the old fashioned way: On the stove. I cooked 40 g. oats with 1/2 dl. water and 1 dl. almond milk and added a dash of pink himalayan salt and 10 drops of stevia. After I took it off the stove I added 1 scoop of vegan vanilla protein and 1 teaspoon of ground cinnamon. I’m not a huge fan of the vegan protein I’ve found in Dubai so far, so I’m going to hold off on recommendations until I’ve tried a few more products. Any vegan protein powder recommendations are more than welcome! But added to my oats and in combination with the almond milk, stevia and cinnamon, my vegan protien porridge turned out quite tasty. I topped it with 1 banana and a tablespoon of organic smooth peanut butter. – Lunch was my the home made garlic/tomato pasta and beans dish and 200 g. cooked vegetables and for dessert I had another Lenny & Larry protein cookie. – For dinner I ordered a vegan Poke Bowl from Poke Poke. I chose a low carbs version with a mixed salad base and tofu as my protein. – For dessert I had a handful of grapas and a slice of crisp bread wit organic peanut butter and jam. – On Wednesday I had a vegan smoothie and two slices of crisp bread with peanut butter and jam for breakfast. The smoothie was made from frozen spinach, frozen blueberries, 1 banana, 1 slice fresh pineapple, 1 scoop vegan vanilla protein, coconut water, cashew milk, a few drops of stevia and 1 teaspoon chlorella and 1 teaspoon spirulina. – Lunch was another smoothie made from frozen berries, 1/2 banana, 2 slices fresh pineapple, cashew milk, chia seeds, flax seeds, 1 scoop vegan vanilla protein and a few drops of stevia. – For dinner my friend and I went to Urth in JLT and I had their whole wheat pasta with vegan meat balls and a small side salad. For dessert I had their carrot cake (which I wasn’t a fan of) and a handful of grapes. – For breakfast (at 1:30 pm) I had a vegan smoothie at the gym made from almond milk, vegan vanilla protein, oats, 1/2 banana and peanut butter. – Lunch was the Super Salad from Urth. It has kale, quinoa, betroot, sweet potatos, avocado, green peas, sunflower seeds and a delicious pomegranate dressing. – In the car i snacked on some baby carrots with hummus and a banana. – For dinner at around 8 pm. I ordered the Super Bowl from Circle Café which is so far my favorite place to order plant based meals. It comes with a honey soya dressing which I asked not to get. I also ordered their amaaazing sweet potato fries. – For dessert I had Lazy Day’s Ginger snaps cookies and a couple handfuls of grapes. – For breakfast (11:30 am) I had my vegan smoothie at the gym made from almond milk, vegan vanilla protein, oats, 1 banana and peanut butter. And an americano with a dash of almond milk. – I didn’t eat for the rest of the day until 7 pm when I was going to an evening brunch* with my friends. I knew being vegan at the brunch could be a challenge, and I was right. Literally everything had some type of animal product in it, even the salads. I decided that I wanted to just let go and have fun with my friends, so I ate whatever I wanted to at the brunch. After competing in bikini fitness for 3 years and sacrificing so much to follow a specific diet, it’s just not worth it to me anymore. I don’t feel bad about technically not completing the challenge, because I had a great night out with my friends and enjoyed every moment! *Brunch in Dubai means you go to a restaurant and pay a fixed amount for 4-5 hours of unlimited foods and drinks! Saturday was veeeeery chilled and relaxed. I stayed in bed alllll day and did nothing but eat and sleep. I had some orange juice and made a green smoothie, ordered the Super Bowl from Circle Café, ate sweet potato fries, sorbet ice cream, some fruit. Perfect hangover Saturday, vegan style. First of all, I was surprised by how big my appetite was throughout the whole week. I guess I expected to be feeling less hungry and eating less overall, since I was eating very nutrient dense foods and getting more fiber than usually, but that wasn’t the case at all. I literally felt like eating 24/7 and even after a big meal I didn’t feel satiated. Usually I stick to 2-3 main meals, don’t feel like snacking in between meals and rarely eat dessert, but as you can read from my food log I was having snacks between meals and som type of dessert almost every day. I think it’s too early to say that my increased feeling of hunger is due to eatingvegan, as it might just me a coincidence that I’m currently more hungry than usual, but it’s an observation that I made. Secondly, I was surprised how easy it was to live a vegan lifestyle. Eating purely plant based meant my food options were limited, obviously, but except for at the Friday brunch, I was never in a situation where I couldn’t just grab something vegan at a restaurant or in a store. One of the mistake I made this week, is relying more on shakes and snacks to keep my going in between meals, where I think I should have just increased my veggie-consumption even more. Unfortunately I’m not a big fan of raw veggies and salads anymore. So those are rarely what I reach for when I’m feeling hungry. When I have to eat veggies I prefer to blend them to a smoothie or cook them pretty hard. Definitely something to be aware of and work on for me! I used to love veggies. Now that the challenge is over I’m craving red meat really bad. It’s nothing new, I crave it all the time, but it’s kind of annoying me as I wish to go vegetarian (or at least pescetarian) by the end of this month. I hope it’s just a matter of habit and not a sign my body needs red meat to get everything it needs. Usually I eat intuitively and simply just have whatever I crave, but if I choose to become vegetarian I won’t always have that option anymore. It makes me question whether it’s the right choice and the right time, but I still feel like trying it for a while. Veganism is too restrictive for me personally (at least right now), but besides my huge appetite, I felt amazing and the food was super tasty. I will cut down on my dairy consumption in the future and whenever possible choose plant based milk instead of cows milk, but for now I will continue to eat some yoghurt, cheese and butter. I will also keep eggs as seafood in my diet for now, and who knows, I might go fully vegetarian (no fish) eventually. Living plant based for a week was a great experience overall!